While diving in the Plumper Island Group near Telegraph Cove, British Columbia, I chanced upon a white-ringed ribbon worm (Tubulanus albocinctus) fully out in the open. This is the first time I have been able to see the whole animal and marvelled at it’s length and colour. This “specimen” that I filmed was more than 1 metre long. Apparently, they can reach 6 metres in length! Ribbon worms have unsegmented bodies but what sets them apart from all other worm species is that they have a “proboscis”. The proboscis is a part of their gut that can be launched out to wrap around prey and then retract pulling the prey into the ribbon worm’s mouth. Venom may also be associated with the proboscis. The white-ringed ribbon worm may prey on segmented worms, small crustaceans and maybe even some small fish. The proboscis can also be used for digging. In the video clip (link below) you will see how the animal moves with powerful waves of muscular contraction (peristalsis). Small hairs called cilia also help it glide along. In trying to find some basic facts about this species’ natural history, I discovered that very little is known about it even though it quite common in the Pacific Northeast. Although not able to find research to support this, I believe that the animal’s bright colour is a warning to predators that it tastes bad or is toxic. I assure you I will be on the lookout for this wonder worm to try to learn more (I would love to see the proboscis in action)! 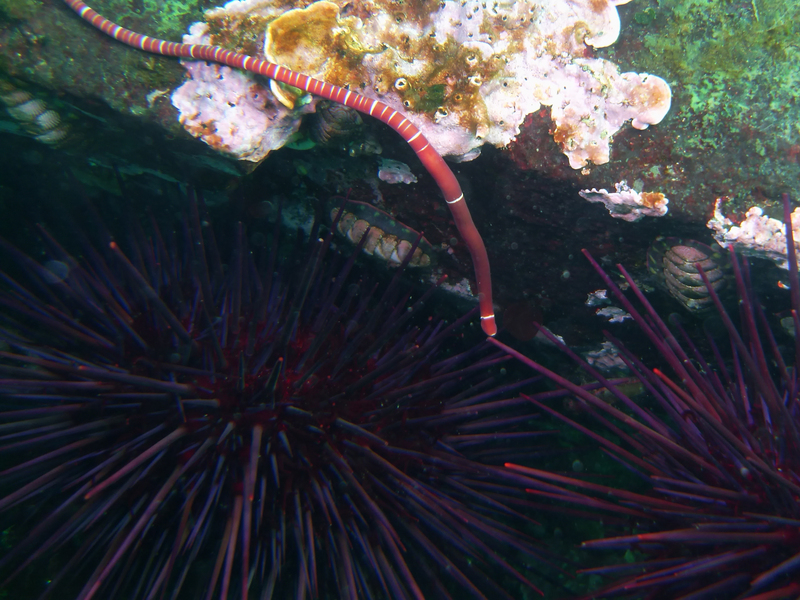 See the short video clip (30 sec) of my white-ringed ribbon worm encounter at this link. More on ribbon worms at this link (includes a diagram of the internal anatomy). Update January 12: A neighbour, Graham MacDonald, shared his observations of white-lined ribbon worms preying on rockweed isopods on a local sandy beach. He has repeatedly observed a black structure extending from the worm to the isopod and moving around on the isopod (likely the probosis). He noted that it appeared that the isopod was suffering (due to toxin or digestive juices?) and that it was a prolonged process. I will definitely be going to sandy beaches to see if I can capture this on film. Thank you Graham.